Camera slider effects have become a staple in everything from Hollywood films to amateur YouTube video. The point of view of a camera moving slowly and smoothly through the scene is visually compelling. This effect used to be exclusive to high end productions that could afford jibs, cranes and dolly tracks. But today’s tiny cameras, especially smartphones, have made tracking slider shots available to everyone. Commercial camera sliders are available in all price ranges starting under $100. And there are DIY devices that can be built for ten dollars or less. HandlePod wrapped in a paper towel slides over a desk for a smooth video slider effect. 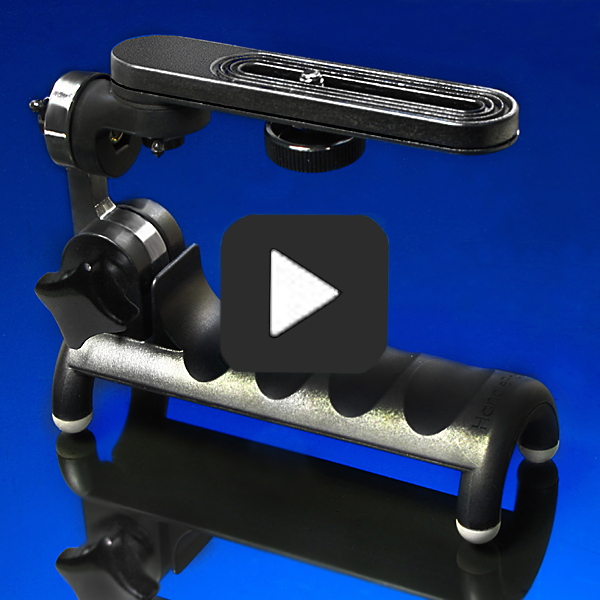 With HandlePod you can create an instant camera slider with one simple cost-free accessory. HandlePod is a comfortable handle designed to be held against any solid surface for camera stability. Its rubber-tipped feet are high friction to prevent slipping, and they work very well. But what if you want move the HandlePod effortlessly across a tabletop for a smooth camera slide effect? It’s easy to do as long as you defeat the high friction property of the rubber feet. How? Just wrap the HandlePod in a napkin, paper towel, handkerchief or any soft paper or cloth. This covers the rubber feet and lets the HandlePod slide effortlessly over any surface that is smooth and even. Tables, desktops, shelves, countertops, anything that offers a smooth surface can be used for sliding video effects. Even vertical motion is possible on door jams and windows. The hood or roof of a car is another possibility. HandlePod wrapped in a paper towel will slide smoothly over any unblemished object. Wrap the HandlePod feet in Velcro to make it slide smoothly across any even surface. But wrapping HandlePod in a napkin is a less than elegant solution. It is a fast and simple but there is a better way. Wrap a one-inch strip of Velcro around each foot. The soft fabric part applied to the HandlePod’s feet provides a frictionless surface that will slide effortlessly across any smooth object. Velcro eliminates the non-skid properties of the feet. When you are through sliding you can remove the Velcro and use the HandlePod normally. With HandlePod and a few pennies worth of Velcro you can create a video camera slider that will work with smartphones using a tripod adaptor, small video camcorders, or any video capable camera including a small consumer DSLR. If there is no smooth surface to slide across, you can build your own slider for just a few dollars. More about that in another blog. This entry was posted in Tripod Alternative on December 29, 2014 by main user.